MEXICO CITY -- The U.S. government wants stronger efforts to stem the flow of heroin and fentanyl from Mexico and is critical of a dip in opium poppy eradication, Deputy Secretary of State John Sullivan said. The Drug Enforcement Administration said in its 2017 National Drug Threat Assessment that Mexican heroin accounted for 93 percent of heroin tested in U.S. markets in 2015, practically displacing production from South America. It said Mexico's opium production more than tripled between 2013 and 2016, noting "this increase was driven in part by reduced poppy eradication." The Mexican government's own figures showed poppy eradication dropped by 15 percent in 2016, but appeared to be rebounding strongly in 2017. The DEA said Mexico's increasingly refined "white powder" heroin is purer than other varieties. "Increasing poppy cultivation in Mexico, the primary supplier of U.S. heroin markets, ensures it will remain high-purity," the U.S. anti-drug agency said. "More rigorous, collaborative efforts to confront the threat posed by the production and distribution of heroin and fentanyl are a priority for the United States," Sullivan said. Sullivan acknowledged the responsibility - and pain - shared on both sides of the border. "In 2016, the (Centers for Disease Control and Prevention) estimated that 64,000 Americans died from drug overdoses, over 20,000 of which were synthetic opioids, including fentanyl. But the overall problem is not ours alone. 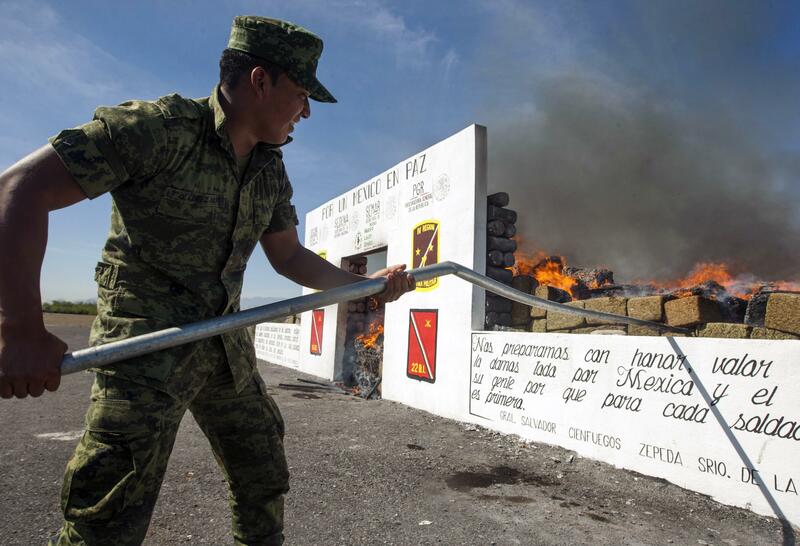 An estimated 100,000 Mexicans have died from drug-related violence since 2006." Mexico had a broad dip in most drug-fighting indicators in 2016, for reasons that aren't entirely clear. The number of miles covered in surveillance flights by the army dropped by 51 percent from 2015 to 2016, while those by the navy fell 72 percent. Criminal drug cases filed by prosecutors dropped from 27,870 in 2012 to 6,219 in 2016. "Seizures at the Southwest border declined in fiscal year 2016 for the first time in almost a decade, despite increasing heroin production levels in Mexico," apparently because traffickers are moving smaller loads in private vehicles that are harder to detect. Because fentanyl is stronger and has a higher profit margin then heroin - and doesn't require a long supply chain to grow and refine - it may eventually displace heroin, the report suggests. Currently, most fentanyl is sold disguised as, or mixed with, heroin. "It is unclear how much market share fentanyl has gained from heroin, as the two markets are so intertwined.," the DEA reported. "However, some heroin indicators suggest fentanyl is significantly impacting market share and, in a few markets, even supplanting the heroin market."